If ever there is an image of the inclusiveness of the reign of God, this is it: the great picnic that unfolded every foodstuff you’d always wanted to taste but were never allowed to, until now. God could have just whispered in Peter’s ear: Go and preach the gospel to everyone and open your doors to all, and intellectually Peter might have taken that on board. God could have said: go and broaden your theology. Go and speak to others that have a different world view from you, and spiritually Peter might have taken that on board too. But for God to really get the point across, there was the need for some theo-drama. God needed to offer Peter a picture that illustrated the seismic shift that this Gospel imperative was about and God came up with the big picnic where on the menu today was all things foreign, that wouldn’t just set your tastebuds tingling but your heart racing, your theology backflipping and your doctrinal alarm bells clanging and perhaps cover your soul in goosebumps. This was a cosmic shift and Peter was never going to “get it” unless he could picture it. 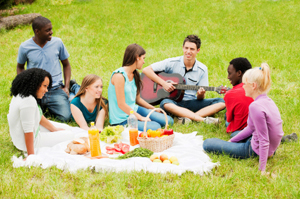 Peter almost didn’t get it, even then, but when the kingdom of God suddenly expands dramatically, you don’t need a sermon, or an instruction manual, or a general assembly to discuss.You need a picnic. Words and laws and rules don’t do it. We need to see it in the flesh, especially the flesh of all the things we are not allowed to eat. God’s been doing it for… well, for ever. Looking forward to hearing more about New Kilpatrick Parish Church’s picnic church. Seems this might be a perfect week to launch such a venture. Hope they post something here. This entry was posted on April 23, 2013 by Wood Lake Publishing in 2013, Lent Easter 2013 and tagged food, Gospel, inclusion, Peace, picnic.